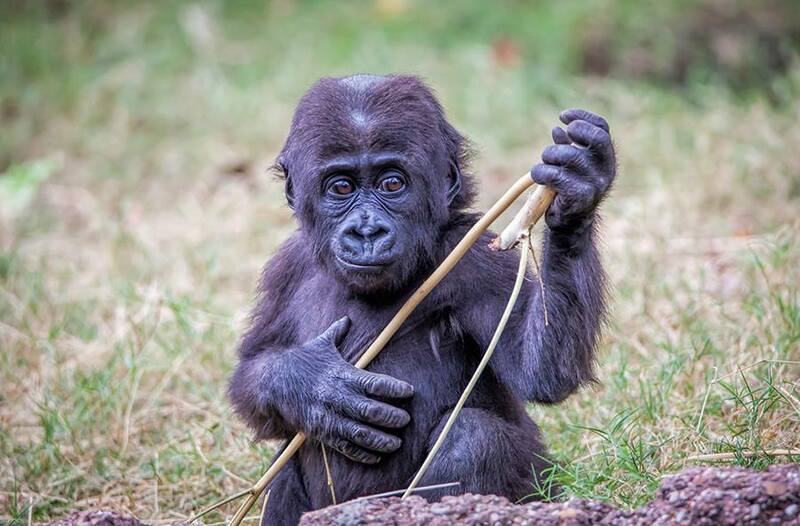 Meet Gus, the Fort Worth Zoo’s first baby gorilla. Each day is filled with new firsts that you don’t want to miss. Come watch him grow! Become a Zoo member and watch him grow any day of the year. Time of Birth: 3:43 a.m. The birth of Augustus, or “Gus,” was one for the record books at the Fort Worth Zoo, as it was the first gorilla birth in the Zoo’s 107-year history. 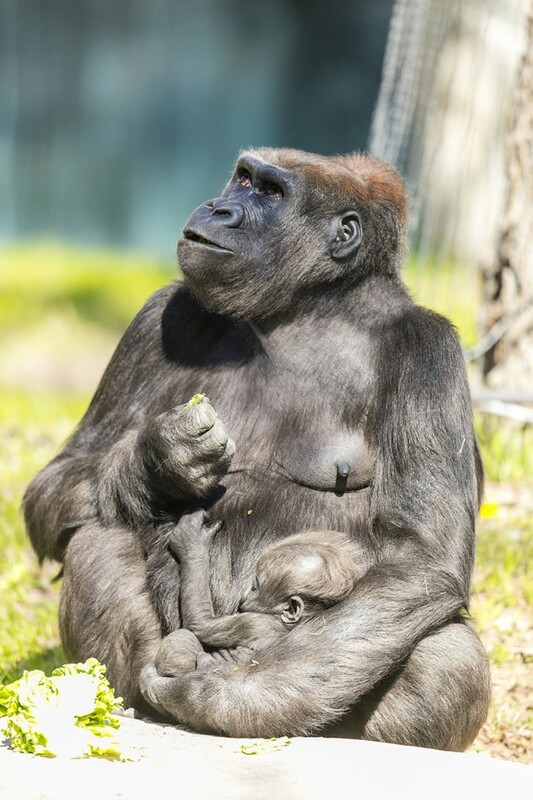 Gus’ mother Gracie joined the Zoo’s gorilla family unit commonly called a troop , in 2014 on a recommendation that her arrival would hopefully result in a successful gorilla breeding. 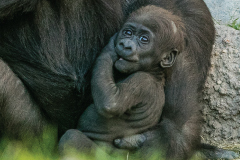 After a picture-perfect pregnancy, Gus was born on Dec. 5, 2015 at 3:43 a.m. After spending a few days alone in an off-exhibit area together, Gracie and Gus rejoined the troop. Gorilla offspring grow approximately twice as fast as human babies do; they are able to sit up, crawl and cling to their mother by the age of 3 months. 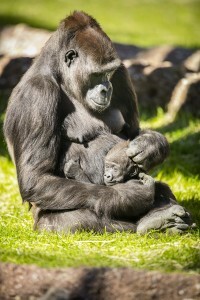 Young gorillas are dependent on their mothers for locomotion, food and socialization for the first few years. Gus is growing more independent by the day and can often be seen doing barrel rolls around the exhibit. He is also starting to jump from rock to rock and climb on the structures and tiers of the outdoor habitat. As Gus grows more comfortable leaving Gracie’s side, he is beginning to interact more with dad, Elmo. While he’s still comfort nursing, Gus is beginning to eat more solid foods. He particularly enjoys baked sweet potatoes and bananas – yum! The Fort Worth Zoo held a mock election this spring to determine a name for the baby gorilla. Playing on the 2016 presidential election year, Zoo guests were asked to submit names in our Primate Primary and then vote on the final four name selections, Augustus, Crockett, Mosi and Grover, at one of our polling places (Facebook, Twitter and at the Zoo). It was an exciting campaign season to watch! At one point, three different names were leading in the three different polls. Grover led the Facebook vote, Gus led the Twitter vote and Mosi was the favorite for in-park voters. Local celebrities also endorsed their favorite name and TCU’s SuperFrog actively campaigned on behalf of Gus. However, once Pittsburg State, a small university in Pittsburg, Kan., got wind of the contest, they encouraged their students to vote for the name that happens to share the name of their mascot, Gus the Gorilla. Within 24 hours, Gus surged from third place to first, surpassing Mosi and Grover. The Zoo is celebrating this birth as a huge conservation success. Western lowland gorillas are listed as critically endangered by the International Union for Conservation of Nature (IUCN) due to hunting and disease. Gorillas also have an alarmingly low reproductive rate (at an observed rate of 3 percent population increase), so even if there was a drastic decline in hunting and disease in optimistic scenarios, it could take at least 75 years for population recovery to occur. Your $40 symbolic adoption will contribute to baby Gus’ care and feeding for one full year. Click here to adopt Gus.